If you want to get to know someone, I mean really, really get to know someone then go traveling with them. When you spend every waking moment with someone day in and day out for an extended period of time you’ve pressed far beyond a normal friendship. It’s like some sort of unromantic, dysfunctional marriage, where you’re pretty much stuck with someone for better or worse until the end of your journey. There’s a point in the journey when you realize that your bond has permanently grown closer than your average friendship and it’s what I like to call the “Dude, when’s the last time you used the bathroom” phase. This is what occurs when you subconsciously begin to take on your travel partners problems as your own. Adventuring in the third world already provides many situations of discomfort, fear and confusion, nothing is worse than compounding these negative emotions with a complaining travel buddy. This means that anything affecting your travel buddy, from slight hunger to traveler’s diarrhea you must work as a team to solve. With Thailand behind us we cruised in a slowboat across the river to Houxaiy, Laos. Obtained a visa and settled into a smelly, little guesthouse. Laos only has one beer “BeerLao” which is surprisingly better than the beer in Thailand. Consuming some questionable spring rolls and BeerLao’s we tried to enjoy some beautiful scenery through a swarm of nats. 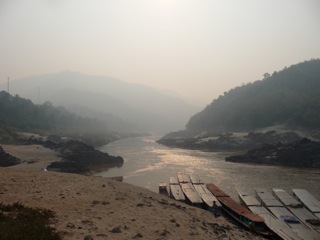 The plan was to book a two day slowboat down the Mekong river to Luang Prabang, Laos. We entered a shop to book tickets to find the shop keeper sleeping and some kids running around. The kids struggled to awake the owner who eventually sat up with great difficulty and said he was too drunk then went back to sleep. Spellbound with our first impressions of Laotian customer service, we eventually found a shop with people sober enough to book us a spot on the boat. Comparable to the customer service was the quality of shopping bags in Laos. Shortly after purchasing a bottle of Laos Whiskey the bag just gave out causing an explosion of glass and whiskey all over my sandaled feet. Annoyed for a split second as this was our entertainment for the lengthy boat ride the next day, but then realized the entire bottle cost just over a dollar, so bought a new one. Woke up early feeling great despite the dumpy room, only to find my travel buddy Chad in an uncomfortable state of being. Didn’t realize it until later, but this was the moment where Chad and I moved from friends to travel buddies, for a problem I would normally make jokes about if I was at home made me genuinely concerned. “Dude, I’m still constipated and I think I might have pink-eye” said the legendary adventurer. This level of sharing is normally saved for family and although we couldn’t figure out a way to help the problem, the fact that Chad’s bowel movement schedule was on my mind has to mean something. 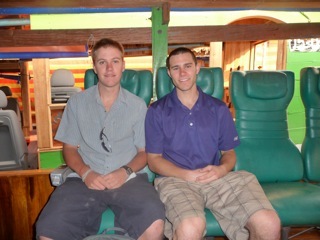 Told to show up to the boat around 8:30am and when we did, we discovered the 7 hour boat ride did not depart until 12:30. 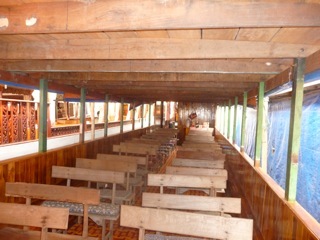 The old, rickety boat was full of small, wooden benches that looked punishing to the behind for the now 11 hour journey. Up front there were a few chairs that resembled a “Fast and the Furious” style car seat. As people trickled in and settled onto the benches we had a brief feeling of Laotian royalty until we were kicked out to the First Class seats and now had the worst pick of the benches. Terrific scenery we ambled down the river drinking whiskey and chatting to some English and Canadian chicks. As day one on the boat came to an end we arrived in Pakbeng a small Laotian village only accessible by boat that marked the halfway point tp Luang Prabang. Got off the boat and climbed up some rocks to enter this tiny village. BeerLao was being advertised everywhere, and we booked a room with two Canadian girls in a ghetto little guesthouse. Grabbed some dinner and BeerLao’s with the Canuks, the power went out halfway through the meal and we had to eat with candles. Now I genuinely love Canadian people, but these chicks annoyed me to an unbearable level. They tried to make it seem like Canadian’s were God’s gift to this earth and American’s were a curse from the devil. Listening to these prideful Canadians tell us how much more open-minded and friendly their countrymen were all the while saying they don’t like people from America was astonishingly ironic. 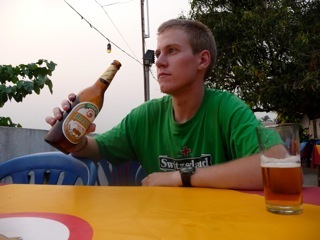 This entry was posted in Laos and tagged Adventure, Beerlao, Laos, Mekong, Pakbeng, Slowboat, Thailand, Travel by verenico. Bookmark the permalink. This is some thing I must find more information about, appreciation for the article. Absolutely love the new design. I was pleased with the information. Thanks a lot for this cool entry. Hi, I ran into this site from digg. It is not blog post I would regularly read, but I liked your spin on it. Thank you for creating something worth reading!